Leprechauns In Alaska covers the remaining leg of Norman and Maggie’s amazing journey, following roads north through the banana republics of Central America where our intrepid travellers are blown off course by a ferocious hurricane. After the storm, the culinary and geographical delights of Mexico before a finale involving an American fairytale that threads through the stunning national parks of the US and Canada. At the end of the road the ultimate challenge: a 900-mile duel with mud roads up through Alaska as the duo attempt to reach the Arctic Ocean. Told with boundless wit and warmth, this is a story that will make you want to saddle up and get travelling. But if that isn’t possible, let Norman’s soaring prose transport you there regardless. So sit back and enjoy the craic! 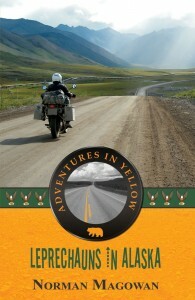 The energetic ‘Adventures in Yellow’ continue with ‘Leprechauns in Alaska’ as they ride ever-northward from Panama to the Arctic Ocean. From tropical paradises and the kindness of strangers to hurricanes and bear encounters, the story is a rollercoaster of epic highs, heartbreaking lows and inspiring persistence to fulfill a dream. Eloquent and witty, Norman has the keen eye for detail and talent for vivid description that’s so essential in good travel writing. Just like the first book, ‘Leprechauns in Alaska’ is hugely positive and full of hope. A wonderful read from beginning to end.